Mom's really hoping these are the final days (or hours) before I arrive. She wasn't sure we'd make it to my due date (the 24th), but here we are, almost a week later. Last weekend Mom and Dad had the weekend to themselves. Nana and Papa wanted to take my brother, Jonah, huckleberry picking up at Mt. Adams and asked if he could stay the night on Friday so they could leave early on Saturday. Mom and Dad said, "Sure!" and had a great time going out to a nice dinner on Friday and then went kayaking on Saturday morning. They were also able to walk through the Street of Dreams condos in the Pearl District downtown. Nana and Papa even asked if Jonah could stay one more night as they were having so much fun together. Someday maybe I'll stay at Nana and Papa's place for a weekend! 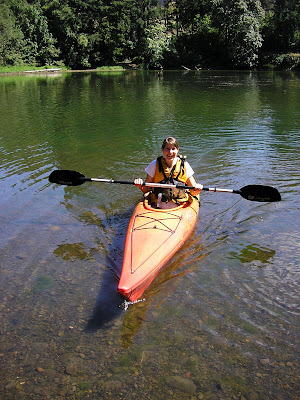 Mom kayaking at 9 months pregnant! Mom also had time to finish crocheting a blanket she had been working on for me. Now there's really not a lot left to do, except keep the house clean. Mom's also having fun spending time alone with Jonah, something that I'll soon keep from happening for at least a little while. Mom saw her midwife, Sharon, on Wednesday and found out she was 3 cm dilated and 80% effaced. Sharon also said Mom's cervix looks great (now that's not a compliment you hear ever day!). She suspects we won't have to come back for an appt. next Wednesday. :) On Monday, which will put us at 41 weeks, Mom goes in for a nontress test to make sure everything is looking alright with me. I think everyone is hoping she doesn't make it a week past the expected due date, but we will see! I like keeping everyone on their toes! Mom finally took some photos of my finished room. She found a pottery barn bumper and crib skirt on ebay that matches perfectly with my room and it was super cheap. Yay! Nana had a collection of tea cups that she wanted to get rid of and so Mom took them to use as a decoration on the wall. She also kept a few of her and Nana's old dolls and we put them on the tea cup shelf as well. Mom found the side table at an antique store and painted it white and added a cute knob that matches the light switch. Here's a photo that shows the curtains (which Nana made when it was just a guest room) and the bookshelf with stuffed animals and porcelain dolls Nana and Mom made together in a class when Mom was just in middle school. It's definitely a room fit for a girl. Mom has even worried about what she'd do if I were a boy instead. She could at least keep the walls yellow! As of today I am a full-term baby. This means that if Mom were to go into labor today, there would be no stopping her. Last week Mom had an appointment with her midwife, Sharon, and found out I am in the same position my brother, Jonah, was when Mom went into labor. I am facing out which means Mom will have to deal with back labor again if I don't choose to move within the next few weeks. Even though this is not ideal, it's better than the position I was in a month ago, which was transverse, meaning I was sideways. Mom's midwife told her to spend some time each day on her hands and knees in hopes I turn a bit to one side. I am perfectly happy where I am, but Mom says back labor is no fun and would prefer if I found another position. Mom and Dad went to a friends wedding this past weekend and although it was hot (the church was not air-conditioned and it was 100 degrees out that day), it was nice for them to go out for the night just the two of them. They hope to do it again at least one more time before my arrival. Mom and Nana's friend, Jenny, wanted to have a tea party in honor of Mom and me. It was a very special tea party with wonderful food and decorations, but mostly it was wonderful because of the people who attended. Nana's closest friends, Jenny and her daughter Katie, Marcia, and Bonnie were there as well as Mom's closest friends, Sara and Mary. Jonah, Kate and Cassie and Gabby were also there at their own cute little table. The temperature got to be over 100, but we were in shade with fans blowing on us, there were cool drinks to sip on, and even ice cold washcloths to keep everyones faces and neck cool. It was well worth it! Below is a photo of most all of the yummy food. There were 2 different kinds of scones with lemon curd and apricot brandy jelly to go on them, 2 different kinds of stuffed mushrooms, cucumber sandwiches and chicken basil sandwiches, potatoes stuffed with sour cream, blue cheese filled apricots, chocolate dipped strawberries, cream puffs, and a gorgeous cake! What a spread! Check out these amazing cream puffs Jenny made in the shape of swans! There were even popsicles to cool us all down! Yummy! Mom felt so spoiled by all the wonderful homemade gifts and cute baby girl items given to her for me. Thank you Jenny and Nana for all your hard work! It was all so wonderful!